Wetted Media Systems provide evaporative cooling and humidification for a wide variety of applications while taking advantage of the free cooling and energy savings inherent with this technology. These systems work by using the heat already in the air to evaporate water as it passes through saturated media, saving on energy costs compared to alternative evaporative cooling equipment or steam humidification. In addition, the Wetted Media System can effectively manage shoulder season cooling load, as well as assist on peak cooling days to avoid the purchase of additional cooling equipment. In retrofit situations where the cooling load has increased, installation of a Wetted Media System is significantly less costly than adding a chiller. Patented Multi-stage System Controlled by Vapor-logic® Controller: Continuous operation is provided by the multi-stage system, because when one stage is in dry-out mode the other stages remain active. Low Energy Usage: Each stage has its own pump, and each of those pumps run only when that stage requires water (up to three stages per system). Reduces cooling load: Every pound of water evaporated into the air removes about 1000 Btu of heat from the air (every kg evaporated removes approximately 2250 kJ of heat). 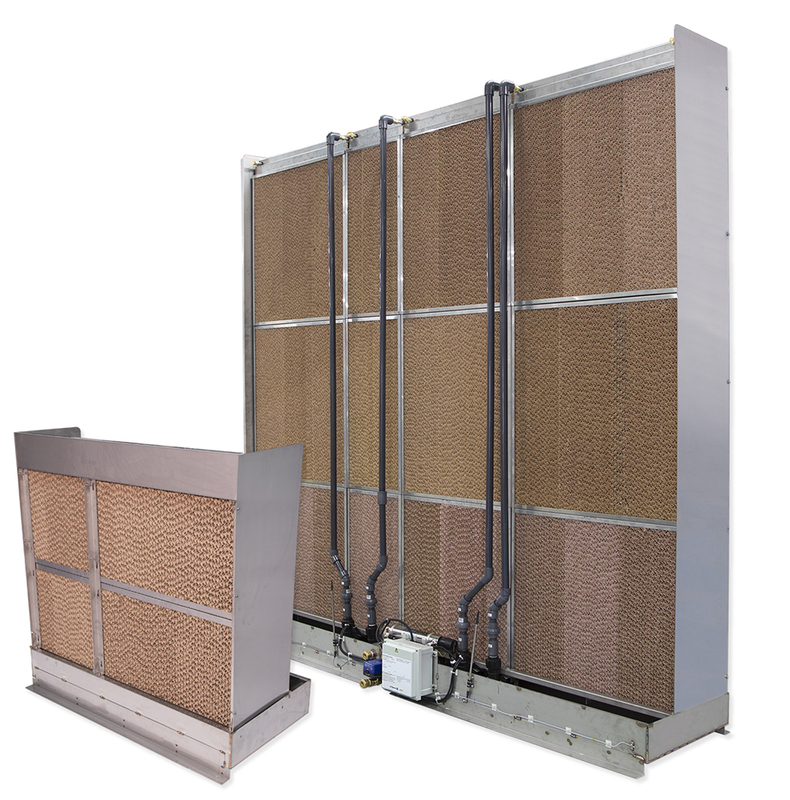 This evaporative cooling effect reduces the building's cooling load, resulting in significant energy savings in applications requiring both cooling and humidification. Two Media Sizes: In addition to 12” (305mm) media, DriSteem offers 8” (203mm) media for situations where there is lower demand. Built-in Droplet Separator: Order the system with a built-in droplet separator to remove water droplets that can form when operating at higher face velocities. The ability to operate at higher velocities delivers more conditioned air to a controlled space. User-controlled Version: The user-controlled Wetted Media System does not include the DriSteem Vapor-logic® controller, which saves on cost while maintaining the flexibility to work with an existing Building Automation System. Low maintenance. The system manages the concentration of dissolved solids to minimize scaling and lengthen media life (patent pending). Replacement media cassettes are easy to install. Reduced water waste and extended media life result from the system's ability to minimize scaling by tracking the volume of evaporated water. Maximum performance is achieved by the controller's monitoring of the system; a message is displayed when it's time to replace the media. Drain blockage is prevented by the system's ability to flush debris before it can settle (patent pending). Capacity: Varies with application. See our performance chart for system efficiencies and capacities. Applications: Any application requiring cooling or humidification. Especially suited for applications requiring simultaneous cooling and humidification. Commonly used in data centers, industrial manufacturing, printing facilities, and applications using air-side economizers. Can be installed in air handlers and ducts.